Scientists this week announced the strongest evidence yet that there may be liquid water on Mars. A paper published in Nature Geoscience described observations made by researchers over the past three years that indicate that water – most likely in the form of a salty brine – appears seasonally on Mars, forming dark lines as it trickles down steep slopes. Although scientists have known for years that Mars once had water, the new evidence provides hope that one day humans may discover life on the red planet. The latest announcement was based on the study of photographs of the surface of Mars. However, we can reveal here exclusively that a super-sekrit kitteh mission led by Commander Kibbles flew up to have a look and can confirm the findings. Yes, there is water, and yes, it is yucky. 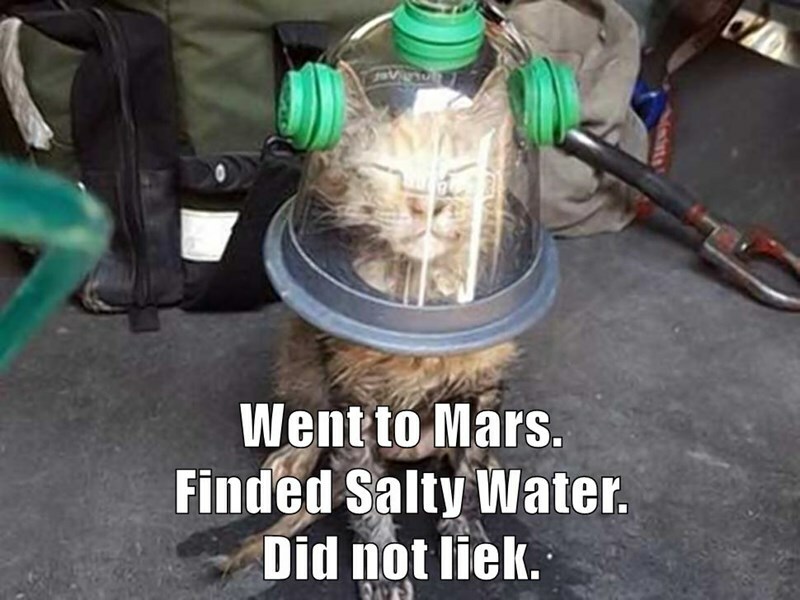 This entry was posted in Science Caturday and tagged mars cat, science cat, science lolcat, Space Cat, water on mars. Bookmark the permalink.